It's been a bit of an off week with our missing of the farm share pickup on Tuesday. However, when life doesn't throw you lemons, you go out and buy some damned lemons. Then you make lemonade! I was fortunate enough to stop by a farmer's market on 97th street this morning. 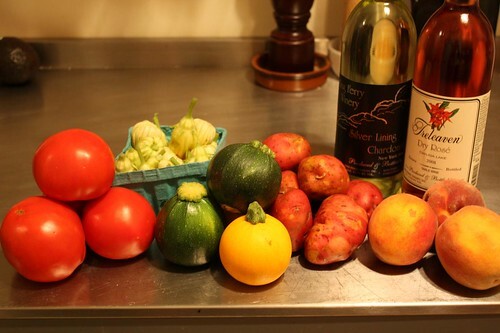 At the 97th Street Greenmarket I picked up some fantastic tomatoes, green and yellow round zucchini, squash blossoms, peaches, red potatoes, and two great bottles of wine. I was fortunate enough to get a sample of these two wines. The rose was great and the chardonnay is quite honestly the first chardonnay I've ever tasted that I liked. The wines were both Treleaven wines from King Ferry Winery. Any winery that can make a chardonnay that doesn't make me sad is okay in my book. 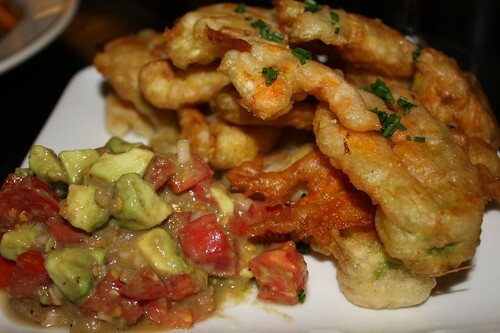 I made a quick beer batter and fried the zucchini blossoms then served them with a salsa I made with shallots, the Greenmarket tomatoes, and avocado. They were fantastic! The best three dollars I've spent on produce this year! Good on you, the State of New York! For the main course I cooked up the zucchini and tomato with some garlic, shallot and mint from my mother's garden. I also boiled some of the potatoes (which weren't quite as good as the farm share potatoes) and drizzled them with olive oil, butter, and fresh chives from Mom's garden. As an unnecessary accompaniment I sliced up some chicken breast -- it was the lowest point of the meal. 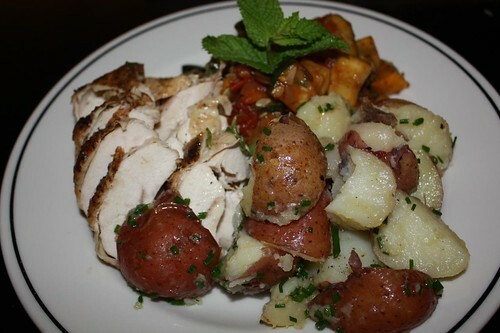 Sometimes it feels obligatory to include meat into a meal even when it isn't necessary. It's like a crutch.